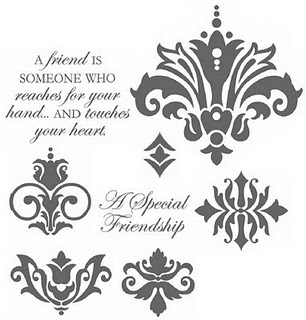 This month, Close To My Heart's Stamp of the Month is Friendship. I decided to get away from the traditional colors of Red and Pink for Valentines Day. I wanted something a little different. I chose to make my cards using the new Lucky paper from Close To My Heart. I love the colors of Outdoor Denim, Desert Sand and Sunset. 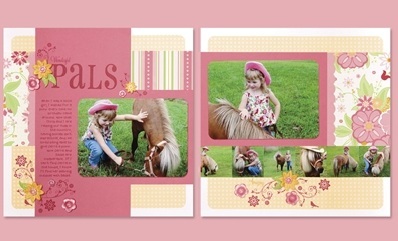 The square card is a 6x6 card using the Background Bar pattern from Originals. The smaller card is a 3x6 card using the patter Name Plate from Wishes. This past week was club week for me. This month my clubs worked on their Wings layout from the Wings Workshop On The Go. The spray pen was a big hit and everyone had alot of fun spraying their pages. On Thursday night, one of the girls had cut her pieces for the layout and was getting ready to lay them out on her base page. The Vineyard Berry and Black damask piece had flipped over and was laying on the table with the Sweet Leaf side up. She loved the color so much, she decided she needed to do her layout using that side of the paper rather than the side that was instructed. 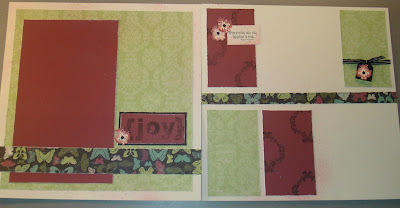 She substituted the Butterfly B&T for the Sweet Leaf Cardstck and used Colonial White instead of Black for the base pages. The layout turned out beautiful. I just had to share. 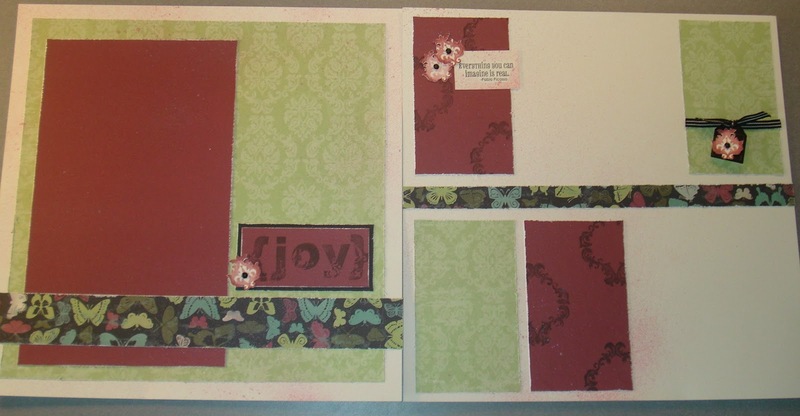 ﻿ ﻿ This just shows how versatile Close To My Heart papers are within their own kits! I'm one week away from my Spring Summer Open House and I can't wait to share the new products and workshop kits with everyone! 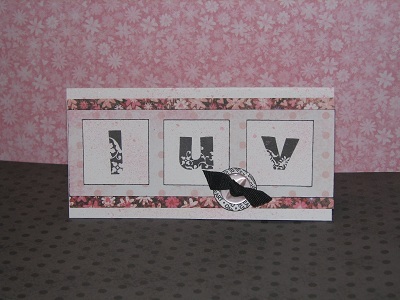 I'm planning a Valentine card for a Free Make & Take. We'll be using the new Sweetheart Paper, Bohemian Stampset along with the fun spray pen technique. Browse the new products and sign up for some upcoming workshops. You can sign up for the February Workshop, Sophia, which we will be doing on February 24th. 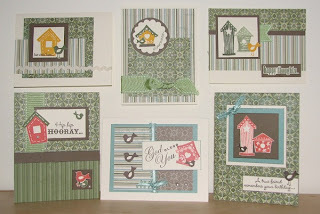 Or how about my upcoming Card Chatter Workshop on March 10 / March 12! After you've checked out the new products and signed up for my workshops, be sure to check my Clearance section. I had to clean out my scrap room to make room for these new products! I'll have LOTS of paper, cardstock, stamps (new & Used), and more at LOW prices! PLUS, choose from many handmade cards I'll have for sale! DOOR PRIZES? Of course, there will be door prizes! Not only will this be a Spring Summer product celebration, I'm also celebrating 5 WONDERFUL years with Close To My Heart. So I'm making it fun - 5 is the Lucky number on this day! 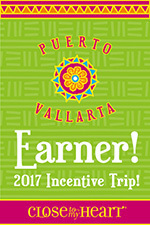 While you are there, you will have a chances to earn lots of tickets to win some great door prizes! You get to choose which prizes to try to win! How about a new Faux Leather Album? These are beautiful post albums that were introduced last July. The faux leather looks luxurious and the colors are beautiful. I will have one to give away! Or you can try for this cool Chair Organizer! This will help you keep your crafting table clean by keeping your most used tools and How To books at your side and off your table! The only way you can get this neat organizer is by coming to my Open House and earning a chance to win! This is NOT sold in our Idea Books and I was lucky enough to get my hands on one! 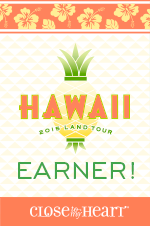 There will be more prizes to win! If you aren't able to come to my open house, you still have a chance to win! Just place an order through the EZinvite. I'll have a special drawing from the customers that order through EZinvite. 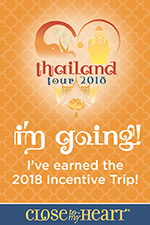 Be sure to send me your email address and I will make sure to send you the special invitation to order from to be included in the drawing. So come on! Bring a friend and stop by anytime between 9am and 1pm. If I have you on my mailing list, I'm sending you a special invitation on Feb 1st. When you RSVP "YES" you will already earn ONE ticket when you come in the door! Not on my mailing list? Sign up today! For more information on my Open House Celebration go to my February calendar. For more information on my upcoming workshops see February calendar for Sophia and March for the Card Chatter workshop. I've had several requests for an All Occasion Card workshop this year. When I saw "Bless This Nest" among Close To My Heart's newest stamp collections in the 2011 Spring Summer Idea Book I just KNEW this would be the stamp I'd center my cards around. These challenges have really helped me with my designs. I designed one card for the Mojo Monday #173 challenge already. If you missed it, you can click on the Mojo link. This week's H2H Challenge was to use any animal or bird on a card. Did someone tell them I was working on this already? It seems like lately, the H2H team must be reading my mind! Here is card #2 for my upcoming Card Chatter workshop. There will be 6 cards in this workshop so be sure to stay tuned. I will be posting all six cards in the coming days. Check out the other great artwork on the H2H Challenge blog. I got a little behind posting last week. My husband had to have surgery on Thursday and I've had family & friends calling and bringing food. Now I've got several thank you cards to make! I couldn't wait to see this week's Mojo Monday sketch. I already knew that I would use this one as one of my thank you cards. For my card, I used the new Sophia paper again. Have I said how much I love this paper? Maybe it is the bright cheery colors in contract to this dreary wintery weather we've had lately. It will really cheer you up. I also used the new Sweet Leaf ribbon around my circle - I just cinched it up by pulling the thread on one side. 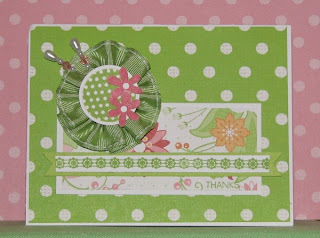 My 'ribbon' across the front of the card is from one of our new stamp sets - Eclectic Edges. See below for full recipe and then check out all the other Mojo creations on their blog. Stay tuned this week because I have another card to post for the H2H Challenge. 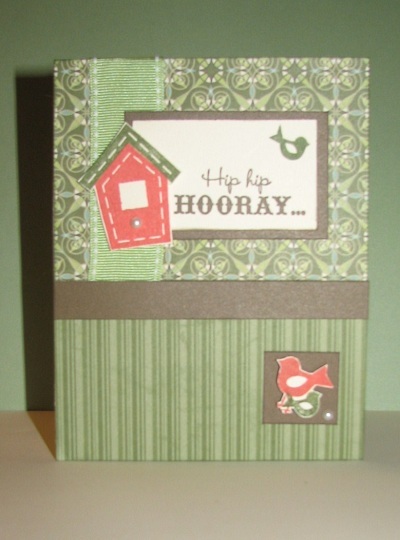 It is another card from my Card Chatter workshop series that is coming up soon! Now - got visit the Mojo Monday blog for more creations on this week's sketch! One of the things on my TO DO list for today was to work on the Sophia Workshop on the Go. This is the workshop project that my clubs will be doing in February. I needed to finish it before we meet this month so they can see what they will be doing next. The Sophia paper is sooo pretty! When I saw today's Mojo Monday sketch, I knew I had to use the Sophia paper for it. 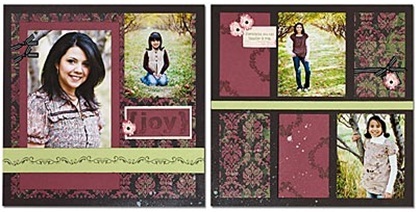 My card will give you a little sneak peek at the new Sophia paper that is coming in our 2011 Spring Summer Idea Book. One of the things I wanted to resolve to do in 2011 was to challenge my creativity. To do this, I am going to participate in more blog challenges! The Mojo Monday challenge was created by Julee Tilman in 2007 on her own blog. It grew so much in popularity that now Mojo Monday has its own blog with a very talented design team! These challenges are meant to inspire and challenge your creativity. So join in on the fun. Challenge yourself. 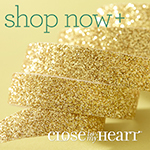 I recently received my new Close To My Heart Spring/Summer products and I couldn't wait to start playing with them. One of my 'instant' favorite stamps from this book is called Bless This Nest. I HAD to have it. 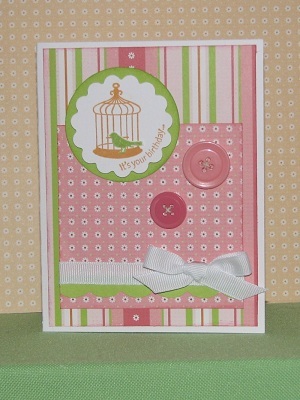 The card I have designed here will be one of the cards in my Spring Card Chatter Workshop (Date still TBD). I can't wait! 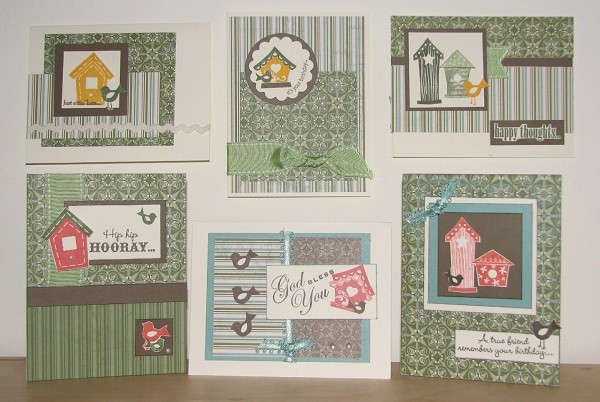 I'll be posting the entire Card Chatter Workshop Collection soon. (When I get them all made!) So be sure to check back for details on this fun upcoming workshop! I'm taking a break from my Organizing to post my entry for the H2H Challenge. It is a well deserved break too! I've been doing so much sorting and straightening lately. Take a look at my scraptable! It was just BEGGING me to mess it up! I was excited about doing this H2H Challenge. The H2H Challenge is a color challenge and I was ready for a change in colors! I still had not received my order of the new Spring Summer products to play with so I've been working with the new Wings paper kit almost exclusively. We were allowed to add a touch of sorbet. Here is my H2H Color Challenge entry: "Dream"
For the color of Sky, I used B&T paper from Magnifique and Sky Cardstock. Pear came from the B&T paper from Olivia and Pear Cardstock. "Dream" is stamped in Sky using the new "Dreams Come True" Stampset that is featured in this month's January Inspiration Brochure. This stamp is regular $22.95 but if you purchase the Wings WOTG Kit (G1016) you can get the stamp set $18.00! My touch of sorbet is the flower from this same set, and the ribbon. I 'hand-sticthed' the edges of the card with the Sky Exclusive Ink Marker. And my table? It's about to get REALLY MESSY. My shipment of new products came today and I'm ready to play! It's is something I'm trying to overcome. I LOVE the look of ribbon, buttons, brads and lots of bling. But I have this fear that I will use them up and won't have any left. It's not like I don't know where I can get more! I remember once doing a card in a workshop that was embellished with 15 tiny brads in a semi-circle. It looked really cute but OH MY it was hard for me to add 15 brads for just ONE card! I'm getting better though. I think I'm about to overcome this behavior. But in the meantime, I've got lots of embellishments! I love the look of embellishment jars that you see lined up on cute little shelves in magazines. But until I get that dream scraproom that is just not functional for me. I need easy access and if I go to a crop I want to be able to take what I need without having to pack a box of jars! I'm ALWAYS looking for ways to store my embellishments. It will be one of those ever changing parts of my scraproom. But I'm going to share with you how I'm storing them..... for now. I have found a couple of things to I do like though and I will point out the reasons why. Close To My Heart used to sell their embellishments in tubes that contained 6 jars of different types of embellishments.... like brads, conchos, safety pins, photo clips, etc. When I first started as a consultant with CTMH, I purchasd these Accent Tubes in various colors. I purchased a My Accents Organizer last year and organized many of the accents I had from these tubes. Organizer Holds 60 jars. Jars sold Separately Z188 - $3.50 for six jars. Now here is something I thought would be just great when I found it in the craft section at Walmart. I was so happy and couldn't wait to get home to organize all my brads. See the little acrylic case to the right of the Accent Organizer? It contains 24 little containers with lids. I sat down and labeled each container with the color of the brad. "This is so perfect" I thought! It's small, holds alot of assorted colors, easy to pack to a crop. Not so I soon discovered. The lids easily pop off when I try to remove the container from the case. The brads spill out everywhere. Even when I was trying to take this picture a lid popped off and brads spilled out when I was removing it from the container. Here is something I do like though.... My Acrylix Organizer. They are not only just for storing our My Acrylix Stamps! I use them for my accents! The 3 dividers help to keep things neat. I use one box for our new Mini Medley Accents and some of the trendy new Level 2 Accents that we sell. I also use a My Acrylix box for my Waxy flax, Floss and Hemp. These are stored in the front of the box while I keep the envelopes of paper flowers and older sassy strands near the back. I also have some journaling spots in here. I like how I can lay the threads on their sides and I can easily see what colors I have. I hope to eventually have this box for ONLY threads. I'd love to have all the colors of waxy flax! I have two other boxes of embellishments. One for ribbon and buttons that I put into old ribbon tubes, the other box has yet more embellishments. I do like these boxes. They have handles that snap onto the lids and they stack nicely. They are clear so I can see a little bit what I have stored in them. I got these at Walmart. I can stack my embellishment box on the top of my workstation shelf for easy assess. My Accent organizer and that hated brad case are on lower shelfs. 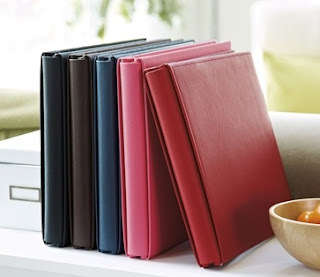 The Accent Organizer shown above is a retired item and Close To My Heart no longer sells them. Hopefully, they are coming out with something in the fall that will help us all to be more organized! So, what are some GREAT suggestions you have for organizing your embellishments? What would YOU like to see in embellishment storage that no one has thought of yet? Scraps Scraps Oh How I love my Scraps! When you are a scrapbooker, cardmarker or into any kind of papercrafting I think it is very hard to throw away even the smallest of scraps. You never know when you might need just a piece of something and if you are like me, you hate to cut a big sheet of 12x12 just because you need a small square! So I'm saver of scraps! In the beginning, I had a terrible time deciding how to keep and organize my scraps so that I would actually find what I needed and use them! Finally, I think I found something that works well for me. First lets cover the printed paper scraps, or, B & T (Background and Texture) as we Close to My Heart die-hards call them. I rarely buy any other printed papers anymore because I have always found what I needed from CTMH. When you buy the My Reflection Level 2 kits you get 12 sheets of B & T and 10 sheets of cardstock. I can create alot of things with a Level 2 kit but I STILL have nice size pieces of scraps left in addition to that 'itty bitty might be good for a fake button' piece. At first I was leaving everything that came in the kit within that same zip lock bag. Even if I was down to just a few pieces. But over time I accumulated so many 12x12 zip lock bags that contained bits and pieces of paper and cardstock I was running out of room to store! When a new Idea Book comes out I know it is time to go through my kits. I will sit down and go through each kit separating the cardstock from the B & T paper. Then I sort by color groups. into the 12x12 bags. I probably have about 12 color groups If I have one or two full sheets of cardstock or B&T, these go to my full stacks that I keep on my shelves. I keep the 12x12 bags in a Sterilite container that is 6" tall. The reason I don't put them in a deeper container is because I like the way I can flip through the bags and see the papers without pulling them out to see those 'itty bitty pieces that might be good for a fake button'. And Stickease? I usually have a few pieces of stickease left. What better to use them than on quick cards made from scraps of course! So I cut down the stickease sheet leaving only the unused portion and store them in 2 zip lock bags. The bags are stored it in the front of my B &T scrap container. Now onto my cardstock scrap storage! I do love this solution for my cardstock scraps. I found this really cute expanding file at Walmart a few years ago. I think it was in the fall when all the Back to School supplies were of abundance. This expanding file has a handle on the top and a clasp on the front. Just close it up and go! So easy to take to a crop! I like this container because it has semi-clear plastic dividers which are durable. There are 19 pockets which gives me many color groupings! I can store pieces of cardstock as large as 9x12. I keep both my B&T scraps and my cardstock file tucked away under my scrap station for easy access from my worktable. By the way..... recently when I was going through my latest paperpacks to sort, I FORCED myself to throw away anything smaller than a 2x2 square, including lots of 1x6 strips! So Bye Bye 'itty bitty pieces that might be good for a fake button'! Stay tuned for more ideas on organizing my scraproom! I just reorganized all my ribbon! See my post HERE to see what I used! During the week of Jan 17-23 the H2H Challenge is all about sharing your Organizational tips. If you want to see more Organizing ideas check out the H2H Challenge Blog! I'd love to hear how you tackle your scraps! Leave a comment and give your best tip! A fresh new year means a fresh new start in my scrap room! I like to clean up and file everything from the previous year's business and usually this means taking a look at how I've stored and stocked my supplies in addition to how I have kept my business records! This month I'll devote my blog to organization so over the next few weeks I'll share with you how I organize (or NOT) all things scrapbooking/papercrafting and record keeping! Now, I don't have a nice big studio that we all dream of. You know the great big room with huge windows that let in lots of natural light. The walls are painted a light yellow like sunshine and there are shelves and closets on every wall full of baskets and drawers. A big worktable in the middle of the room high enough to stand and work if you choose. The worktable has shelves and drawers to hold all the essentials. There is a computer/cricut workstation area tucked in the corner of the room. Oh so sorry - I must have been dreaming again. This is nice - But it's not mine! Well my art studio will have to wait. In the mean time, I have a makeshift studio that works just fine. I live in an older ranch style home - you know the kind with the foyer you walk into and just to the left is a nice big formal living room for entertaining. Our formal living room has seen its share of entertaining but never formal. When my girls were little, it was a playroom full of toys. As they grew older, they had their slumber parties in there. When I started scrapbooking, I had a rolling tote, and a plastic tote with a lid for all of my supplies. I set up a table in front of the window (a smaller window than the one in my dream) where I could leave my work out. When I decided to become a Close To My Heart Consultant back in February 2006 I knew that I would eventually need more than just a tote to contain my supplies. How lucky am I to have a handy husband that loves to build things! We sat down together and thought out what I would need to help me organize my CTMH products. He built a nice worktable with lots of shelves for albums, cardstock and even all my inkpads! My workstation built by the BEST HUBBY in the world! Here is a close up of my ink pad slots. I group my inks in Seasons vertically with the Basic Colors across the bottom row. I can fit 3 pads into each slot. I also store the same color marker beside each pad. When I go to retreats or crops I do have the Close To My Heart Ink Organizer and Carry Case which I LOVE! It is a 'must have' if you don't have one. I sort my cardstock in color groups.... basics, blues, greens, reds, etc. I can lay my cardstock flat on the shelves. There are cardstock slots on each side of the desk but I use the slots on the right side for my extra page protectors, 8 1/2 x 11 white and colonial white cardstock, envelope flats and miscellanous other items. Stay tuned this month for some tips and ideas! Leave me a comment on your Favorite way to organize! I love reading all ideas for storage!